But before you can be a person who creates and shares valuable content, you must first be a person who consumes valuable content. To truly become an expert in your field (as opposed to merely convincing others you are), reading relevant articles and books by people smarter than you ought to be part of your regular routine. So first and foremost, I read to better myself and my knowledge of the industry. But I also know to be as effective as possible, I must leverage my activities. So when I read an article that I also want to share, I have a system in place to share that content immediately, schedule it to post on a specific date, or save it for later. My system has evolved over time. Initially, I consumed all my content on a desktop or laptop. But as I obtained mobile devices, I needed ways to share and save content from these as well. And since I don’t use either exclusively, these tools had to sync to one another, so that content I saved from my smartphone could be accessed from my laptop when I was ready to actually share or schedule it. This article will focus on setting yourself up with the tools I use, without necessarily explaining why or how I use them. Next week, I’ll show you why and how I use each one—and how you can, too. Each of these have both free and pro accounts, but everything I’m about to describe can be done using the free versions. Here’s how to set each one up. 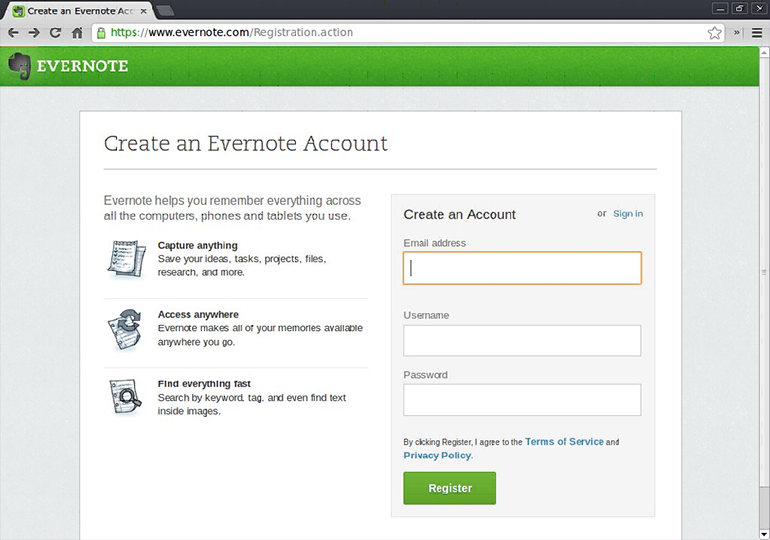 Evernote allows you to create or save formatted text, web pages or excerpts, photographs, or even voice memos as notes within the application. To say that Evernote is note-taking application is an understatement, but for our purposes, it’s a place to save articles to share later. Evernote is available both as a desktop and web app, as well as iOS, Android, Windows phone, and Blackberry mobile apps—all of which sync to one another. Now, download the smartphone app and log into your account. 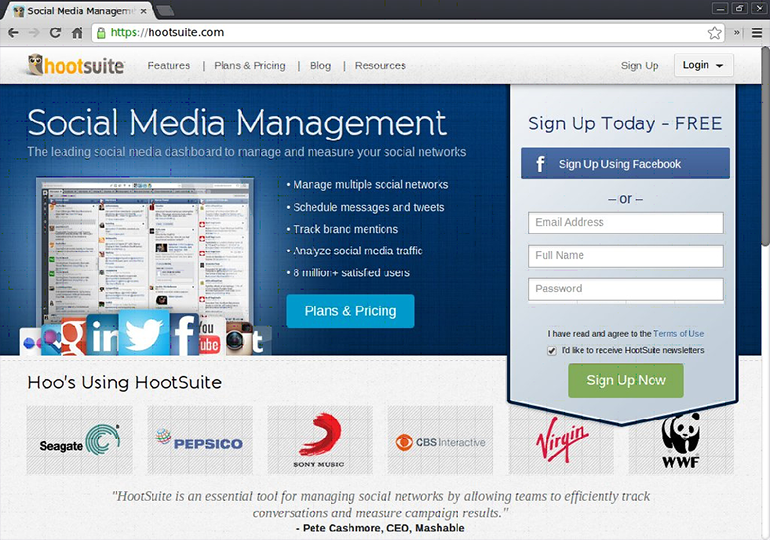 HootSuite allows you to manage multiple social media profiles from a single interface. But even if you’re active on just one, there are a number of advantages to using it. Head over to HootSuite and create your account, then add your social media profile(s). Next, install HootSuite’s Hootlet browser extension. If you’re using Firefox or Chrome, the Hootlet icon will appear on the upper right, just like Evernote’s. IE users will need to drag the Bookmarklet icon to your bookmark toolbar for the same functionality. 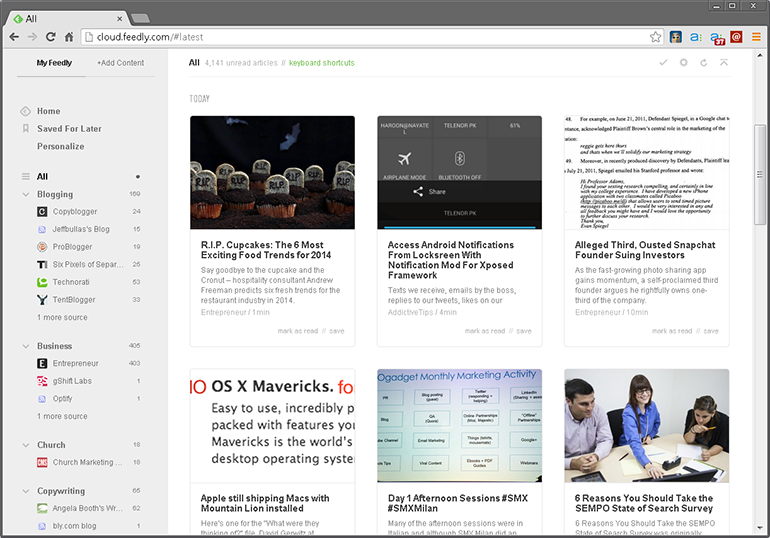 Feedly is an RSS reader that allows you to pull in content from your favorite websites and blogs into one handy interface. Start off by creating your account. You can add content by clicking the +Add Content text at the top left, then pasting the link to the website or blog you want to add. 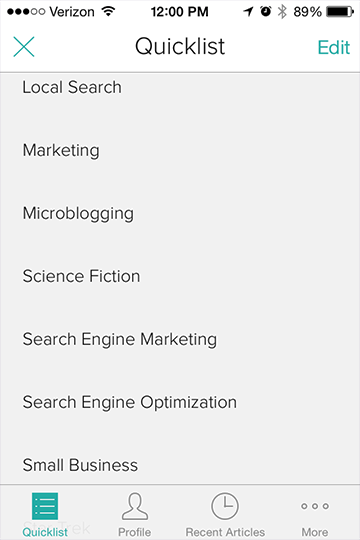 You can also create categories for better organization, if you like. Next, download the Feedly smartphone app and log in. Zite is similar to Feedly in that it pulls content into a single interface. But rather than picking specific websites or blogs, Zite pulls in relevant content based on the topics you choose. The other way it differs from Feedly is that it’s only available as a smartphone and tablet app. So all you must do is download the app, create an account and set up your topics. Why do I use both when each does more-or-less the same thing? Because with Feedly, I can be sure not to miss articles from my favorite websites or authors; whereas, these may or may not appear in my Zite feed. Conversely, Zite ensures I find articles on my topics of interest from sites all over the web, and not just ones I’ve subscribed to. Ultimately, it’s your choice to use one or the other, or both. Feedly and Zite are the tools I primarily use when relaxing and reading at day’s end. As I said, consuming content is part of my regular schedule, and these tools help me do so. Built into these tools is the ability to save content I’d like to share later. In my next article, I’ll discuss how I use each of these tools to save, schedule, and share useful content.